Alchemical Marriage – Downloadable Class Now Available! This is an invitation to join me for a sacred painting session. A time to enter the mystery of the Alchemical Marriage for yourself – to explore your connection to these compelling symbolic stories and to make an icon of love. This event was a livestream event broadcast on Saturday, September 28. Yes, the course is still available on our Livestream event page! Also, when that is over, you will get a link to watch and even download the entire session. and in invitation to our Red Thread Cafe Circle. the one you are with. You will make it what you choose – but we will be working with two figures, Lovers. In my work I teach less on what the answers are, as in, I won’t be teaching what Alchemical Marriage is, I will be inviting our guests to explore what it means for them. I will be calling the circle, creating the container for each person to explore what that is for them in their lives. So, whatever spiritual tradition one comes with is the perfect place to be. If you want to do some more study on the topic, google away, as it is complex and fascinating right at your finger tips. No experience needed in painting: This will be a step by step painting journey and ritual that will result in the creation of an icon of love exploring the Alchemical Marriage. Male and female. Human and Divine. Shadow and Light. Union of opposites. Sun and Moon. External and Internal. AND how that is transformed through alchemy when they are brought together consciously in the realm of love. We will explore that space between the spaces and get access to information about our own Alchemy within that we didn’t have access to before. Working with painting – image and symbol will show you things about the alchemy available to you that you didn’t even know existed – this is the work of intentional creativity. We will be engaging in intentional creativity: Each person will be invited to CHOOSE the intention for their day and to build a Sabbath Altar connected with the specific sacred work that they want to do. What comes up for you when you think about the iconic lovers? Can you see yourself in that? Or not? If not what do you think of or see? Do you refer to your mate as a lover, or spouse or? What does it mean to relate to the loved one of your heart as truly lover. Or relate to yourself as lover. Or even, Beloved? As soon as you Register you will receive instructions for materials, altar building and preparation on how to prepare. We will use the same basic materials we have been using in the other classes and any size canvas you would like, the bigger the better and I will be working with a 1X2 ratio and most likely on wood, but any size will work and any medium including paper if that is what you have to work with. Have you ever kept a Sabbath? It is how I keep my sanity in a busy world. In the Hebrew tradition Sabbath starts with candle lighting on Friday night and goes through sundown Saturday – so this is a chance to create a Sabbath all about love – and yes if you cannot join us live you will be able to access it via online for the first week, then downloadable video a week later that is yours to keep. This is part of my own Spiritual Work: This is a special treat as it is the first time I am broadcasting a Red Madonna Painting class open to the public. This theme is based in the Tree of Life working with the Sephirah of Binah and the correlation of Binah with Chokmah. You will have the choice to join us for the month of October in the Red Madonna if you choose – and receive the deeper teachings on Binah with Caron McCloud and Havi Mandell, or not, it is your choice and you can still keep the videos for your very own and do the process at your own pace. We are working with two forces coming together for good, the uniting of the sacred union. Each of us will explore these concepts for ourselves and call forth the understanding and the connection with that Alchemical Marriage in our own life. Spend time consciously creating IN LOVE: This time spent together in conscious sacred acts of creativity is sure to be a blessing for any and all working with concepts of love and union. We will work specifically with the vesica pisces as a symbol. This symbol worldwide has many meanings from many traditions, chief among them is the sign of marriage, of the feminine and birth, the fish and the opening of the Christ space between the two spheres. Ancient Christians would draw it on the ground to show that they were a part of that clan. 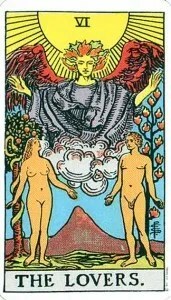 It is also the sign of two eggs/ovum coming together which is often associated with Virgin Birth. 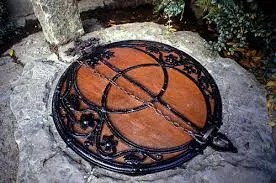 The image at the left is the symbol on the Chalice Well in Glastonbury, England. Wherever you are on your love path – reflection on the union can be a powerful tool for viewing your heart work. Each of us can discover so much about ourselves by just exploring that interior sacred place where our own two worlds merge. For those of you seeking your mate: This painting journey will serve as a wonderful icon of love in your relationship area of your life and can serve as an on-going altar piece. In Feng Shui they say you should set up a relationship corner to call in your mate. What do I think about calling your mate? I believe in doing all of it – of getting ready for them to come. Of calling them with your heart voice – of letting them know that you are there and ready. In my life I have always painted and done rituals around my partnerships, both for the personal inner marriage with self clarity as well as the work of ‘calling in’ the one that we want as our very own Beloved. The word Beloved is so sacred because it can refer to the Divine, and also to your own mate. This is sacred play. I will make it as safe as possible for all different spiritual traditions. If we all remain open and excited and set up our own spiritual containers, what we create in community could be truly transformational. Painting with intention is an alchemical act. What started out as one thing, truly becomes another. Register to get your place now to participate in this creative ritual of paint and love. The alchemical marriage has many legends and among them is the inner mystical marriage. There are so many layers of this material that resonate – it is hard to know where to even begin. So – let’s just begin with an inquiry into our hearts. I hope you will join me for this adventure into the heart.